This week: Nobel winners' research papers go public, cautions on lighting-as-a-service, and rare earth mining revives in the US. An American company has become the first in at least two decades to remove rare earth materials from an underground mine in the US. US Rare Earths is working a mine in Idaho to extract and process a "300-ton stockpile of pre-mined material" that includes europium, dysprosium, and neodymium, among other elements. Europium in particular is in high and increasing demand because of its use in phosphors. The article in InvestorIntel.com may or may not have motives related to UREE's stock price, which is hovering around all-time lows. Certainly the article has only positive things to say about the company and its outlook. 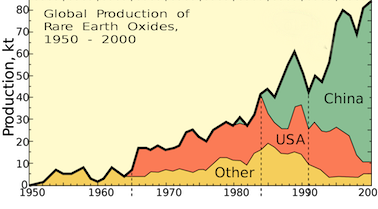 And the article makes it a point to downplay the prospects for recycling for easing the rare-earth squeeze any time soon: "The much touted recycling of rare earths (a very popular solution on paper) is very far from offering a realistic alternative. Should REE recycling technology even develop at an industrial scale able to address global demand, it is estimated that the share of rare earth recycling by 2020 will still account for just 10% of supply." That financial caveat aside, though, I am heartened to see a glimmer of hope that the US might put a dent in China's 97% market share for the supply of the rare earths that are critical for almost every high-tech industry, including ours. A European banker, Quirin Shujis, spoke about the arrangement in which municipalities finance LED street lighting upgrades out of projected energy savings. He stressed that such models can be tricky to get right; they bring up considerations with which the procurement departments of local councils, towns, or cities may not be equipped to deal. Shujis referred to the entities offering financing deals as Energy Service Companies, or ESCOs. They may be utilities, like the one with which the Italian city of Torino is working to finance street lighting. It's not clear whether the banker's talk considered the case where the ESCO is a lighting company, such as Philips working with the Washington Metropolitan Area Transit Authority. Among the pitfalls Shujis pointed out: What guarantee does the client have that the energy savings will keep coming? What provisions are made for changes in the price of energy? What if the ESCO has to borrow money to do the deal, how is the cost of a loan apportioned? Shujis's talk might be viewed as a kind of advertisement for his employer, the European Investment Bank, a nonprofit owned by EU member states that advises localities on such matters as structuring Lighting-as-a-Service deals. SPIE, the American Institute of Physics, and The Optical Society have all made available the seminal papers of the six winners of this year's Physics and Chemistry Nobel Prizes. SPIE's more than 100 papers and AIP's more than 170 will be freely available until the end of the year; OSA has opted for a period of 60 days, which should expire in mid-December.